This has been an up and down kinda weekend. While spending time with Penny has been outstanding, my PC has once again decided not to boot into Windows XP. I could not post any new weblog entries while my PC was down. I tried several drastic fixes I found on tech support websites, but this time, nothing worked, and I couldn't even boot into Safe Mode. The only solution was to reinstall XP and lose all my settings, followed by reinstalling all my software. Dadgummit! And that's not all. I have also had a crappy day with my lawnmower. It's not bad enough to walk around my lawn for an hour and contemplate just how idiotic it is to waste an hour of my life every week cutting the friggin grass. No, I have to use a rapidly decaying mower that clogs up on grass clippings and stalls after every ten feet of grass. 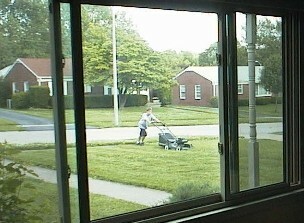 Oh how I wish I could afford to hire a lawnmower punk to do this pointless chore for me. But the weekend hasn't been all bad. Penny is treating me really well. And Danielle and Tanya included me in their Sunday plans (today). Also, I've already received four responses to the questionnaires I sent to my monthly snail mail recipients. Keep 'em coming, folks!! Pictured above, a neighbor boy who used to come around several times a month, begging me to pay him to mow my lawn. You see here the one time I let Ryan do it instead of doing it myself: May 22, 2001.